What are you, DH/SO and kids dressing up as for Halloween? As for me, nothing. I will just walk around with them. DH doesnt know yet. He wants a few different things but they are too complicated to make last minute like this. Cute! Love the costume Im not sure what ds will be yet... or if we're even gonna take him. Im kinda torn. Growing up Ive never been because my parents thought it was wrong (the meaning being halloween and such, so we always just went out for supper then watched a movie) but I think if you take your kids for the fun of it and teach them that then theres no harm. But this year it falls on a sunday, and sundays are our church/family days. So Im torn on whether or not to take ds.... ive talked to lots of my friends and fam, and everyone seems to be doing different things. Hmm.. maybe I wont make up my mind until the day comes. lol. Where did u get your ds's costume?? 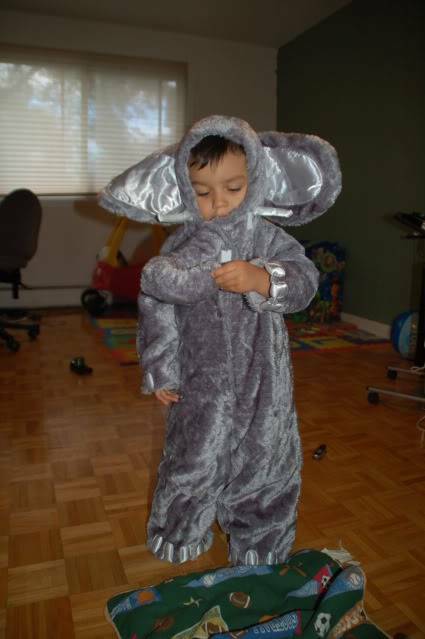 that elephant costume is was cute! Cute! I dunno what william will be yet. Whatever's on sale I guess. lol . Or I might make something. Maybe a pumpkin.